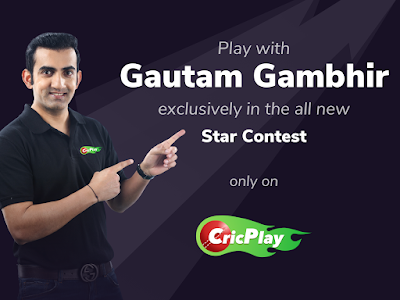 CricPlay, India’s newest free fantasy cricket gaming app is offering a first-of-its-kind opportunity to play online fantasy cricket with cricketing legend Gautam Gambhir. CricPlay users can register to enter the exclusive Star Contest that will give them a chance to compete against one of the most respected cricketing minds to have represented the Indian Cricket team internationally in all formats of the game. To participate in the contest, user would need to download the CricPlay app from Google Play or log in to www.cricplay.com & register for the upcoming 'Star Contest'. Every contestant joining the game is eligible to win a cash prize if they score more than Gambhir in the limited-period contest. The company is also hosting T20-themed ‘Challenger Leagues’, i.e closed group leagues for users to compete with other users on the app that will offer them the chance to win several prizes. CricPlay features five major formats - Fantasy Leagues, Super Leagues, Challenger Leagues, Star Contest and Daily Predictions. In the ‘Fantasy League’ format, the app allows users the choice to play with other gamers across the country and win money, create private contests and invite their friends or join the ones created by them and compete with them in the same fantasy format. Every team scores points basis the actual performance of the player picked during the match, and the highest scoring teams wins. ‘Super League’ is an original gameplay where gamers can select a team per match and select power-ups like ‘Substitution’, ‘Captain Changer’ or ‘Vice Captain Changer’ for an enhanced gaming experience. Challenger Leagues allow users to compete with each other on limited leader-boards & win prizes. Star Contest is one of the most innovative gameplays launched by CricPlay that enables its users to play with one of Cricket’s greatest minds. In ‘Daily Predictions’, gamers leverage their cricketing knowledge to determine a winning outcome before the match starts and win cash provided they have the highest daily consecutive correct predictions.